A ham steak is a useful thing, I'm finding. I bought one a while ago, on impulse, either vaguely recalling an interesting recipe that called for a ham steak, or simply figuring I could use it for something, by golly. I threw it in the freezer and promptly forgot about it. Such is how I roll. But recently pried from its frozen grave, I've used this one steak on two occasions. Half of it went into split pea soup, made in David Crockpott. I used a quarter of the remaining steak tonight with gnocchi and peas. I almost used all of it and I'm glad I didn't because it's really quite salty, especially when paired up with a packaged sauce mix. I used Knorr Garlic & Herb. Remember these? They came out in the 90s, I still remember the radio commercials. Being young and broke in the city, Jeeps and I lived on pasta and we became Knorr Whores for a while. I don't use them as often now but they are handy to have around. Bring water for pasta to boil but do not salt water. Add gnocchi and cook until they rise to the surface. Add the peas and cook another 1-2 minutes. 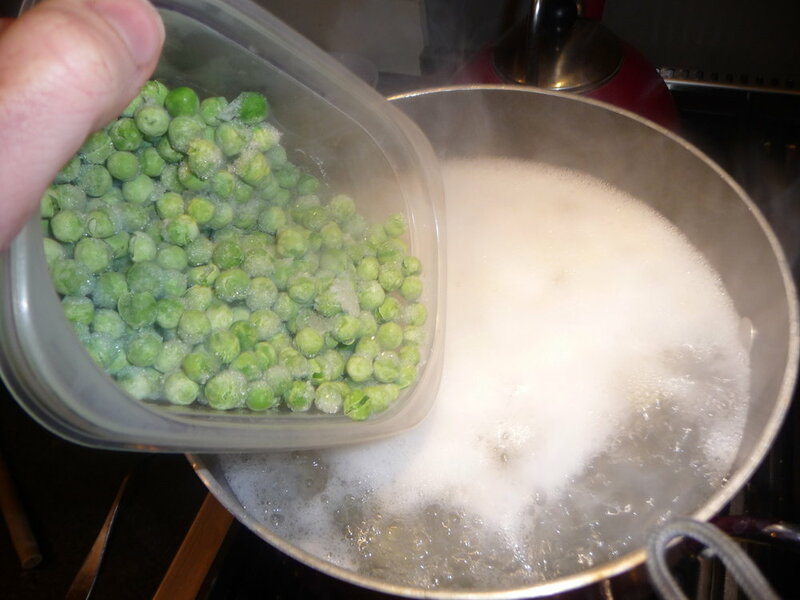 Reserve 1/4 cup pasta water, then drain pasta and peas in colander. Return pasta to pot, add diced ham and the sauce and toss well.